Furniture Now is the #1 destination for affordable home furnishings in the Bexar County area. We have been in the furniture industry since 1914, and we absolutely love what we do. With our quality products, competitive prices, and exceptional customer service, we guarantee a superior furniture shopping experience unmatched by any other business in the area. When you shop at our San Antonio, TX home furniture store, you can always count on receiving great service from our team of skilled customer service professionals. Our customer service staff are knowledgeable about everything that we sell, and they can answer any questions you have about our furniture products or services. Our staff members are there to help you every step of the way, even if you shop with us online! Customers can visit Furniture Now any day of the week. We are located at 5550 NW Loop 410 and we are open Monday through Saturday 10am - 8pm and Sunday 12 pm - 6 pm. We would love to have you visit us in-store; however, you can also shop with us online anytime. If you have any questions, please email us or give us a call at 210-680-0244. We look forward to helping you create the home of your dreams! 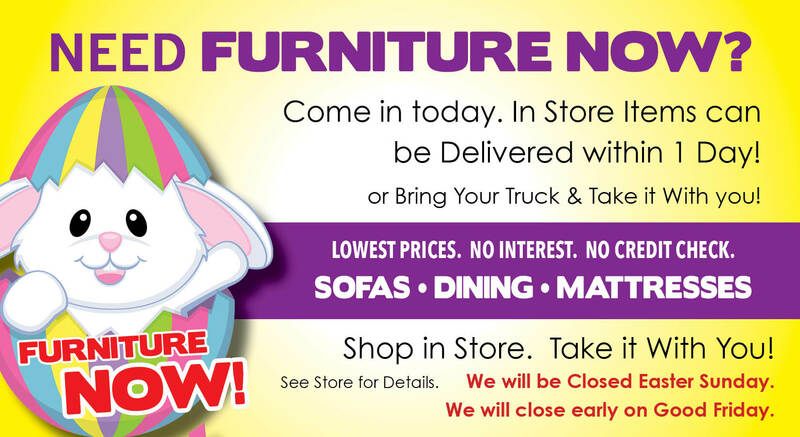 Visit our home furniture store today, where you will find what you want.... right now! Great Furniture at Great Prices at Furniture Now!